Th-INK-ing of You: MERRY CHRISTMAS and BLOG CANDY! Hello dear blogging friends! I prescheduled this post because I am with family this week, enjoying happy times and making treasured memories.... and most of all thanking God for His indescribable gift! To think that even in my rotten sinful state, GOD... the Alpha and Omega, the Beginning and the End... the Creator of the universe, and the Sustainer of all things was mindful of me... just amazes me so much, I really can't fully fathom it! But I stand on His Word as true, and thank Him for so great a love... so great a plan that He would give His one and only Son, and that that Son would humble Himself and become a man so that He could pay the price for the sin of the world... WOW! He did all this because He loves us... you and me! No matter how sinful we have been, no matter what we have done, no matter how far from Him we are... He loves us and wants to have a personal relationship with us! So on this Christmas day... many of my thoughts and prayers will be in thanksgiving for His ultimate gift... Jesus... Emanuel... God with us! I want to wish you all a very Merry Christmas, and a new year filled with God's richest blessings! 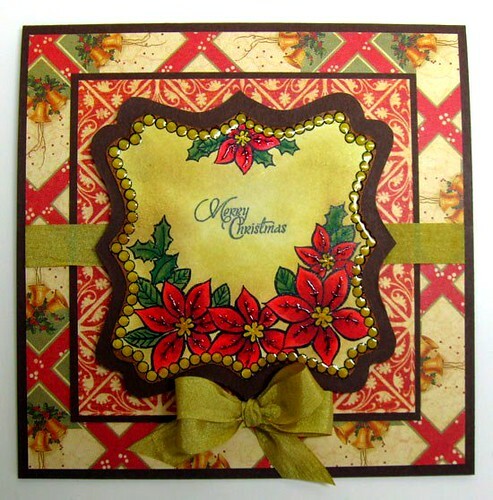 I made this card using Layers of Color Poinsettia Frame cling art stamp and the Spellbinder's Label Sixteen. I love these beautiful frames and having them match the spellbinders dies just makes them even sweeter! LOC is excited to be a Spellbinder's Preferred Company! The designer paper is Graphic 45 and the cs is Gina K.
Beautiful card Grace, happy holidays to you and your family. Thanks so much for all the inspiration I get from your cards! Grace this is so gorgeous!!!! LOVE it!!! I hope you have a truly wonderful Christmas!!!! Grace, this is so pretty. It has such a vintage feeling with that dp. I love that bow. Thank you for sharing your heart and your art! Merry Christmas! Gorgeous creation, Grace! Merry Christmas! Grace this is beautiful Gorgeous colors and beautiful ribbon. This is sooo pretty Grace! Wishing you and your family a very Merry Christmas! Lovely card Grace, enjoy your special family times and may God richly bless you and yours this Christmas and all throughout the year. This is just gorgeous Grace! So rich and elegant. Love your coloring, shading and layout! Merry Christmas! It's positively gorgeous Grace. What a wonderful gift to leave for the rest of us. Thank You. As always Grace...this is amazingly beautiful! Thank you for all of your sweet comments on my blog this year even though lately the posts have been sparse lately...the holidays and sickness in my family have put a strain on my posting. Wishing you the most of Blesseed Holidays!! This is absolutely gorgeous, Grace! I love the papers and the wonderfully colored poinsettia frame! Have a blessed Christmas and I look forward to seeing you soon in the new year! Hugs! Beautiful Grace! Merry Christmas to you and your family, wishing you a very pleasant Christmas. Looking forward to another year of spreading the gospel through papercrafting! Gorgeous card Grace! I hope you had a wonderful Christmas and time with your family. Blessings to you in the New Year! So wonderful card Grace,I love the image and the colours. Very pretty, I like the contrast in soft and vibrant colors!